interactions of minerals, organic components and microorganisms in the soil and their importance in the ecosystem. Antonio Violante, FASA, FSSSA, is Professor of Soil Chemistry in the Department of Soil, Plant and Environmental Sciences, University of Naples Federico II, Italy. Dr. Violante has authored or coauthored more than 150 refereed research articles, book chapters, and invited reviews, and has coedited six books. Pan Ming Huang, PhD, FAAAS, FASA, FCSSS, FSSSA, FWIF, is Professor Emeritus of Soil Science at the University of Saskatchewan in Saskatoon, Canada. Dr. Huang has authored over 300 refereed articles and book chapters, written two books, edited seventeen others, and served on many editorial boards. He received the Distinguished Researcher Award from the University of Saskatchewan and the Soil Science Research Award from the Soil Science Society of America. Geoffrey Michael Gadd, PhD, DSc, FIBiol, FLS, FRSE, is the Head of the Division of Molecular and Environmental Microbiology at the University of Dundee, Scotland. Professor Gadd has published over 190 refereed papers, over twenty edited books, and over forty book chapters. He has received the Berkeley Award and the Benefactor's Medal of the British Mycological Society, the Charles Thom Award of the Society for Industrial Microbiology, and is a Fellow of the American Academy of Microbiology. PART I: FUNDAMENTALS OF SOIL PARTICLE-MICROORGANISM INTERACTIONS. 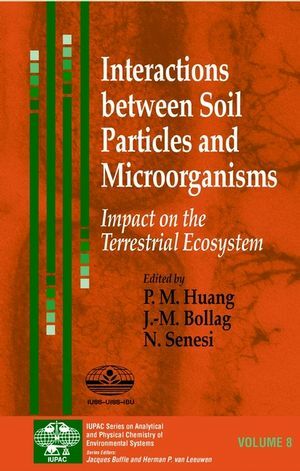 Interactions between Microorganisms and Soil Particles: An Overview (C. Chenu and G. Stotzky). A Fractal Approach for Interactions between Soil Particles and Microorganisms (N. Senesi and L. Boddy). Interactions of Organic Materials and Microorganisms with Minerals in the Stabilization of Structure (J. A. Baldock). Impact of Organic Substances on the Formation and Transformation of the Metal Oxides in Soil Environments (A. Violante, G. S. R. Krishnamurti and P. M. Huang). Microbial Mobilization of Metals from Soil Minerals under Aerobic Conditions (E. Kurek). Interactions of Bacteria and Environmental Metals, Fine-grained Mineral Development and Bioremediation Strategies (J. S. McLean, J.-U. Lee and T. J. Beveridge). PART II: IMPACT OF SOIL PARTICLE-MICROORGANISM INTERACTIONS ON THE TERRESTRIAL ENVIRONMENT. (A) ION CYCLING AND ORGANIC POLLUTANT TRANSFORMATION. Effect of Mineral Colloids on Biogeochemical Cycling of C, N, P and S in Soil (G. Guggenberger and K. M. Haider). Impact of Interactions between Microorganisms and Soil Colloids on the Transformation of Organic Pollutants (J. Dec, J.-M. Bollag, P. M. Huang, and N. Senesi). (B) RHIZOSPHERE CHEMISTRY AND BIOLOGY. Chemical and Biological Processes in the Rhizosphere: Metal Pollutants (P. M. Huang and J. J. Germida). Biotic and Abiotic Interactions in the Rhizosphere: Organic Pollutants (T. A. Anderson, D. P. Shupack and H. Awata). 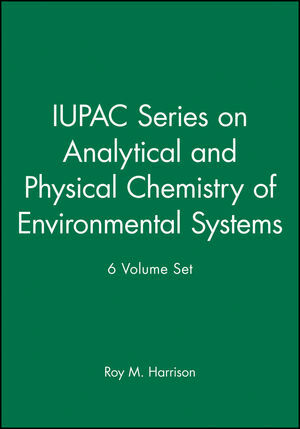 (C) ANAEROBIC AND TRANSPORT PROCESSES, AND THE SUBSURFACE TERRESTRIAL ENVIRONMENT. Interactions between Microorganisms and Minerals under Anaerobic Conditions (H. L. Ehrlich). The Role of Mineral Colloids in the Facilitated Transport of Contaminants in Saturated Porous media (M. Elimelech and J. N. Ryan).